Welcome back my friends to the show that never ends. We're so glad you could attend. Come inside, come inside. 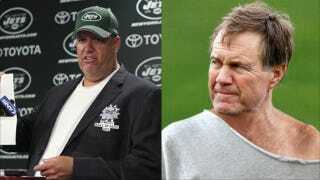 New York Jets at New England (CBS): Someone, somewhere in that vast wasteland that is not the East coast of the United States, invented a Hall of Fame for the sole purpose of inducting Rex Ryan and he ran with it. He's pretty good at tweaking the HC of the NEP, but maybe he should tweak the offense. And the defense. They've both been garbage. Tampa Bay at San Francisco (FOX): The 49ers defense has been pretty stout this year and has even injured two quarterbacks. Those quarterbacks are Tony Romo and Mike Vick, though, so it's a little less impressive. Here's something I did not know before preparing this little blurb: Jim Harbaugh coached Josh Freeman at the University of San Diego. I Have poor reading comprehension skills. San Diego at Denver (FOX): This was an interesting article about the Trading Places style relationship between the Chargers and Broncos all thanks to a game five years ago. Even more interesting? Philip Rivers playing the role of Voice of Reason.